Unfortunately, we live in a day and age when appearance can be very important. That tiny chip in a front tooth or a slight mismatch in tooth size among neighboring teeth, or even the extra-pointy canine can be a focal point for others and a hindrance to your self confidence. 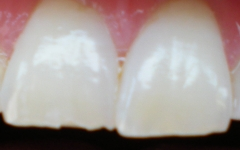 Tooth contouring may make a difference. A chip off the old block may be something that we like to see in our family trees, but not when it comes to our teeth. If you or a family member have experienced chipped teeth, or are living with uneven tooth lengths, slight overlaps of teeth, and tooth edges that are too flattened or have a point to them, you may want to consult your dental professional about tooth contouring, or tooth reshaping. Unfortunately, we live in a day and age when appearance can be very important. That tiny chip in a front tooth or a slight mismatch in tooth size among neighboring teeth, or even the extra-pointy canine can be a focal point for others and a hindrance to your self confidence. If you find yourself staring at these subtle yet distracting features in your own smile, the experts at Longmeadow Family Dental Care can help. Tooth contouring involves removing a tiny amount of tooth enamel with a drill to sculpt a more pleasing shape and make the tooth fit in better with its surrounding teeth. The tooth is then polished for a smooth finish. Since your upper front incisors and canines are your most visible teeth, this procedure is most often used in this area. Cosmetic problems that can be corrected with tooth contouring include fixing small chips, uneven tooth length, slight overlaps, and tooth edges that are too flattened or pointy. It can even be used to correct minor bite problems from teeth touching unevenly during contact. The first step in the contouring procedure is an examination of your teeth to diagnose how the reshaping will accomplish your goal of smile enhancement or to correct a problem with your bite. An x-ray may be necessary. However, most often tooth contouring only involves the removal of a bit of enamel — the hard outer covering of the tooth. Because enamel is not living and contains no nerves, you will likely not need even a local anesthetic. Tooth contouring can be followed with a whitening regimen for a dramatically younger-looking smile. It’s also often used with cosmetic bonding or dental veneers — both of which can be used to reshape teeth with larger imperfections. Find out if cosmetic tooth contouring is right for your situation. Make an appointment with your Longmeadow dental professional today. Any dentist who does not have a contractual agreement with a dental benefit organization to render dental care to members of a dental benefit program.